Wearing fishing gloves isn’t something that all anglers do but it is a practice that everyone should get into. If you are looking for a pair, you are already aware of the benefits of donning them while trying to reel a catch in. These gloves protect your hands from the elements and can also prevent your fingers from getting hurt by the leader. Gloves are also an important part of catch and release fishing as it aids both the angler as well as the fish. Here, you will be able to find some of the best fishing gloves available. I have compared them by determining the level of protection offered, the durability of the gloves, and how much movement is allowed. These Fishing Tree Sun Gloves are ideal for anyone who is looking for warm weather fishing gloves. Now, these are fingerless gloves, so they should not be worn if you are looking for aggressive or large fishing. These are best used for long days in the sun, where you are not expecting too much of trouble from your catch. 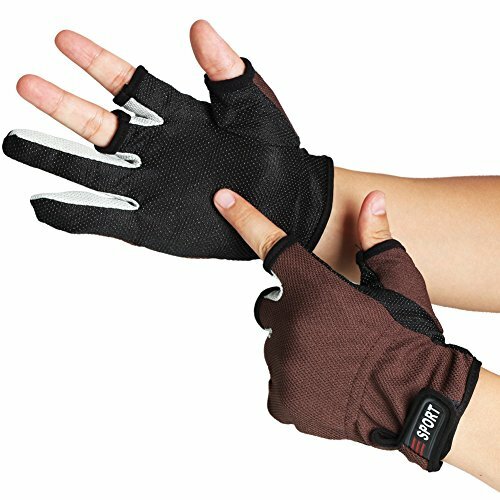 One of the best features of the sun gloves is the sun protection that they offer. The protective agents are woven into the material of the gloves rather than simply sprayed on. Not only does this offer you a greater level of shielding, it also means that the protective layer will be intact for much longer. The gloves have a UPF rating of 50+. The gloves are largely made of Spandex, which allows your hands to stretch and move with ease. There is absolutely no restriction. There are, however, patches of faux leather on the palm of the gloves. This is to increase padding and to prevent calluses and other types of injuries. These are durable gloves as the double stitching holds all of the fiber components together tightly. The gloves can be easily tightened with its Velcro strap, ensuring a snug and secure fit. The gloves are low maintenance and can actually be machine washed after a long day of fishing. These sizes do run a bit small so you should be careful to get the right fit. 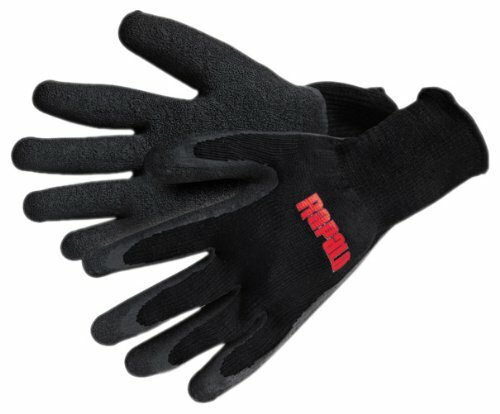 The Rapala Marine Fisherman gloves have been specifically designed to help you reel fish in. Trying to hold a thrashing fish in your hands is not only difficult, it is also dangerous. Anglers often report bites as well as scratches from fins and dorsal plates. The Rapala Marine gloves prevent this. The gloves are made from a combination of polyester and cotton. The cotton is what makes the gloves comfortable and easy to wear for long periods of time. The polyester lends durability, meaning the gloves are a lot more likely to stand up to wear and tear. Over this initial shell, there is a layer of latex coating the gloves. This is to ensure that not even the sharpest part of a fish can penetrate through this layer and that the fish will not slip through your fingers. This added durability also allows you to use these gloves in either freshwater or saltwater, and not experience any negative consequences. It should be noted that these gloves are not waterproof. As such, they should not be used to keep the cold out as once they are wet, it can get chilly. Also, despite the durability of the gloves, they should not be used as fillet gloves under any circumstances. The gloves can be machine washable and then drip dried. There is no need to have to go through any hassle to keep them clean. The gloves are available in large and extra-large sizes. 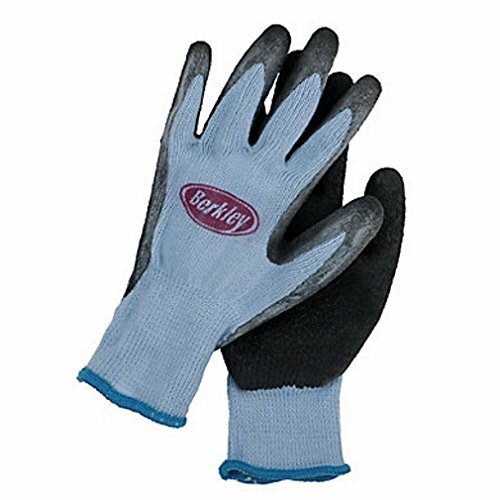 The Berkley fishing gloves are well-rounded gloves. 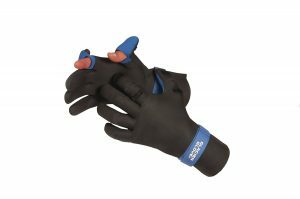 They are incredibly durable and heavy duty, perfect for protecting your fingers from chaffing, cuts, and other types of injuries. Since they cover your hands completely, there are also great at protecting your hands from the sun. They are warm enough to ensure that your hands remain toasty on chillier days. These gloves do work well in water so there is no issue if you have to grab a wet fish while wearing them. If they do get wet, it may be a little uncomfortable. While the gloves are quite thick, they also afford a certain amount of flexibility. You will have no problem using your fingers, even to undertake more dexterous tasks. The underside of the Berkley gloves is textured. This is to ensure that they do not slip either while you are handling the fishing rod or while trying to grasp a fish. They have an excellent grip. Also, you will not have to worry about getting any slime on your or your hands having that lingering fishy smell. There are some limitations with the sizing of the gloves, which is really the only downside here. This means that it may be difficult to find a pair that fits you well. There is a ladies-style glove as well which could come in handy for those looking for smaller sizes. You need specialized gloves when the weather gets really cold or if you are going ice fishing. For these instances, the Glacier Glove Ice Bay gloves are essential. These gloves are made from neoprene which offers you four very important advantages. First, they help to keep your hands warm, even in the iciest of waters. They provide a layer of insulation that will help you to keep fishing for hours on end. As they are water resistant, you don’t have to worry about the water soaking through and making your hands cold. Neoprene is also abrasion resistant. This means that it is very difficult to tear through this material. This protects you from the fishing rod leader as well as any sharp parts of the fish that you catch. Last but not least, these gloves permit dexterity. They fit closely to your fingers, allowing you to use them as you normally would. To make it that much more comfortable and warmer, the inside of the gloves are lined with fleece. These gloves really are ideal for even really low temperatures. The Ice Bay gloves have a sharkskin textured pattern, which allows you to get a tight grip on whatever you are holding, even wriggling fish. The seams on these gloves are glued and then blind stitched, creating a seamless palm. Also, it helps to considerably elevate the durability of the gloves too. The Sougayilang fishing gloves are a cross between full gloves and fingerless gloves. The thumb, index, and middle finger are exposed as they are the fingers that you typically need to handle more precise tasks. The other two fingers are protected to spare you from chafing or cuts. The gloves are made from a mix of cotton and polyester. The two materials used together, allow them to be both comfortable yet be durable as well. There are small rubber particles interwoven into the material. This helps to prevent any part of the glove lending to slippage of any kind. The palm of the glove has increased friction which makes it easier and safer to deal with all types of gear, equipment, and slimy fish. These type of gloves are perfect for someone who wants to maintain a certain level of protection but also doesn’t want their hands to be hindered in any way. Since the thumb and fingers are exposed to a certain degree, these gloves probably shouldn’t be worn if you may be encountering aggressive fish. They are also not meant for cooler weather, especially since the gloves are not waterproof. You should be careful when choosing the size as it may be a difficult fit for individuals with larger hands. Made of Polyester Cotton, Breathable and Comfortable. Non-slip Rubber Particles and Friction Palm Design. 3 Low Cut Glove Fingers: Thumb, Forefinger and Middle Finger. A Good Item for Fishing ,Cycling ,Camping ,Hiking ,Running Lovers . The Glacier Glove Premium glove is a bit more expensive than the other options on this list. Nonetheless, it is well worth the price that you pay for it. This is because it offers you comfort, durability, and flexibility. The gloves are made from neoprene. As a result, they are water resistant, allowing you to plunge your hands into the water without worrying about the fabric getting soaked. Since it is well insulated, you can be certain that your fingers and hands are going to be toasty for the entirety of your fishing trip. 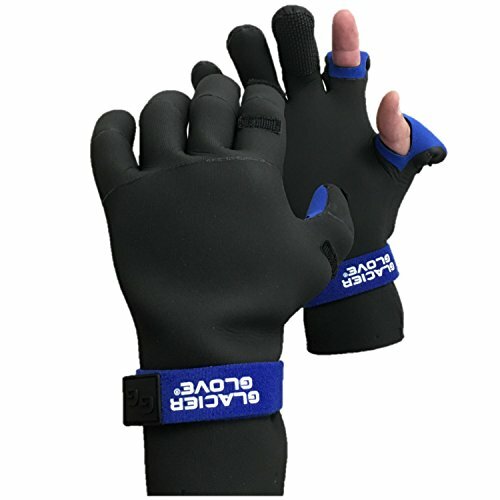 At the same time, neoprene is known for being very pliable which is why you will find it easy to move your fingers around while the gloves are on. The Premium gloves also have fingers that are naturally pre-curved. Due to this, your fingers can remain in a more natural state and not get tired quickly. The best part of the gloves, however, is that that the thumb and the forefingers have slits in them. This way, you can use them when tying knots or attempting other intricate tasks. However, when it comes to reeling your catch in, you can slip your fingers into the gloves and preventing them from getting hurt in any way. This is definitely a glove that has more than one use for it. The gloves come in six different sizes, ranging from small to XXL. This way, most people will be able to find a comfortable fit. Fishing gloves are a dime a dozen so how can you discern the good from the mediocre? 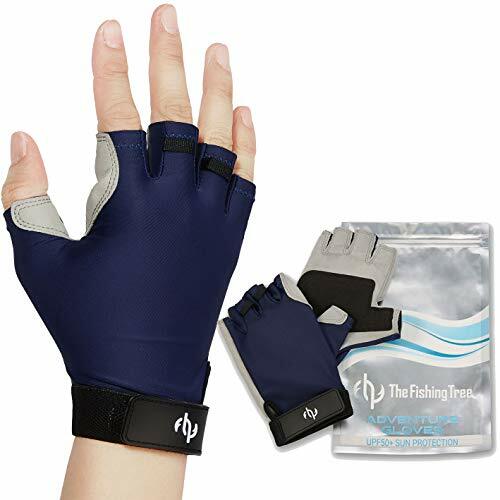 Perhaps the first decision that you need to make with fishing gloves is whether you want full gloves or fingerless gloves. Each of these have their own set of pros and cons. Full gloves are great if you want optimal protection from the elements, including the sun. 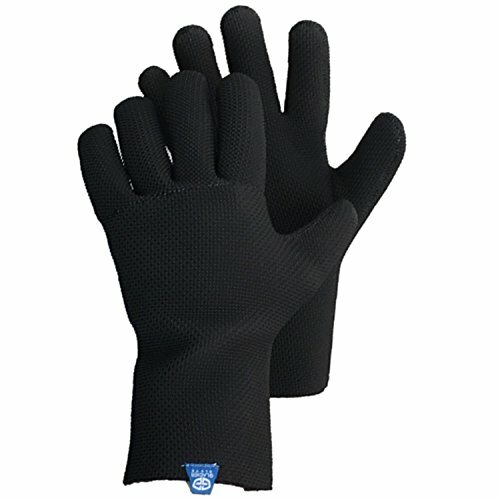 They are also excellent at keeping your hands warm and provide the most amount of protection. You are unlikely to cut or hurt your hands while you wearing such a pair. The disadvantage associated with these type of gloves is that they do reduce movement and dexterity a bit. Therefore, it can be difficult to tie knots or pass a fishing line through while wearing them. Most people tend to prefer fingerless gloves in warmer climates. This is because although they allow you a certain amount of protection, there are also more breathable. Not to mention, it is much easier to move your fingers around and get work done with these gloves. The downside here is that there is only a limited amount of protection. Therefore, you can still get cut, especially if you are trying to reel in energetic or larger fish. There can be variations of these gloves with some having only some fingers exposed while others have slits in the finger placements. These type of gloves offer up the best of both worlds, allowing you to be comfortable and protected, yet maintaining greater flexibility. Gloves come in all types of material including neoprene, wool, and cotton-polyester blend. Again, your material choice will depend on what you want out of the gloves. Wool is an old favorite because it offers a great deal of warmth and comfort. Unfortunately, it can also get soaked through quite easily which can then make the gloves quite useful. Not many fishing gloves today are made from wool as a result. Cotton-polyester is also quite popular as it is quite durable while remaining comfortable. Of course, they aren’t water resistant which can make them quite cold to wear if they get wet. However, they do offer an impressive amount of protection. Also they have the distinct of being machine washable in many instances. Neoprene gloves tend to be a bit pricier than most other fishing gloves. However, they are water resistant which does make them quite useful. They also help to keep your fingers warm and even allow for some movement. If they do get soaked, however, it can take a long time for these gloves to dry. Nonetheless, they are your best option if you want to go ice fishing. Fleece is sometimes used as a lining inside the gloves. These offer up a lot of insulation and keep your hands cold. Fleece is only useful if the outer portion of the glove is water resistant, at least to a certain degree. Remember that the material you choose should also have a considerable amount of durability. It will need to endure being exposed to the sun, seawater, and be tough even to handle equipment and even fish. It is very important that the gloves that you do use have textured grips on the palms. The textured pattern increases the amount of friction that is produced. This can come in handy when you have to keep a tight grip on your fishing rod or when you are holding a slimy fish. The grips are sometimes made of different material than the rest of the glove. The material here is typically rougher than the other fibers. You will need to ensure that this portion is properly attached to glove, preferably with double stitching. The size is just as important as any other aspect of the glove. Not typically gloves are sold with references to Small, Medium, etc. It is better to rely on measurements instead as these are more accurate and will ensure a better fit. You should measure the circumference of your palm, right below your knuckles. This will give you a better idea of what your real size is. Getting gloves that are too small will make your fingers constricted and in the case of neoprene gloves, may even restrict your circulation. Getting overly large gloves aren’t appropriate either. Here you will have to worry about the gloves allowing cold air in. Also, you will find that they are too cumbersome to allow for proper movement of your fingers. If you are go on a lot of all-day fishing trips, you certainly need gloves that offer UV protection. These type of gloves contain special agents to make sure that your skin is properly protected from the harmful rays of the sun. This can prevent sunburn and even skin cancer over a period of time. These are some of the things to keep in mind while shopping for fishing gloves. However, you should be able to find what you are looking for right here in this guide. One of the images that fly fishing will inevitably conjure up is a fishing vest.